In the late 1970s an Arizona farmer and miner named David Hudson discovered some very strange materials on his land. Hudson spent several million dollars over the following decade trying to isolate and purify this material. The substances that Hudson and other researchers have found are believed to relate to the ancient Philosopher’s Stone, sought for throughout the world for centuries. The materials have been called ORMEs, monoatomic gold, white gold, white powder gold, ORMUS, m-state, AuM, microclusters, and manna. David Hudson calls the materials he found Orbitally Rearranged Monoatomic Elements or ORMEs. He also refers to them as monoatomic elements in a high-spin state. Thought by many to be both super conductive and a type of “super fluid”, they may benefit every living cell by improving energy flow. Our Ormus is an alchemical product, not simply mined clay. It is created by a living alchemist who has been working with this substance for many years. Along with the m-state materials it is believed to contain, it also incorporates other important trace mineral elements necessary for brain and nerve function, including iridium and rhodium. This substance has been called Ormus or manna for many thousands of years and is now reentering the popular consciousness as something that is thought to actually reverse some of the effects of aging, expand consciousness and heal old injuries and illnesses. If you are not familiar with Ormus and its study, please begin your research here: www.subtleenergies.com. Barry Carter, who runs that site, is the primary force behind bringing knowledge of Ormus to light today. When taking Ormus many people experience a sense of elevated consciousness, an expansion of awareness, and an immediately noticeable, deeply clear, profoundly meditative state of mind. It is common for people to report increased energy, spontaneous positive changes in health, and a strong sense of feeling younger. Taken for a period of time, this substance has been pinpointed as the key factor in a number of remarkable healings and rejuvenative experiences. Please refer to the Subtle Energies site for more information. Dosage: The recommended dosage for this material is a drop/ball the size of half a peppercorn. This may be increased to a full peppercorn if one wishes. This amount is mixed in water and drunk, early in the day. Our Ormus can also be placed directly in the mouth or under the tongue and allowed to dissolve. Taken in this amount, each bottle of Ormus should last two or three months. Note: These materials are both new and experimental. You must assess the risk of consumption on your own terms: Use at your own risk. Future Alchemy’s sale of these materials should not be construed as a prescription in any way, or as a guarantee of any results, specific or general. That said, my own experiences with Ormus have been very powerful. 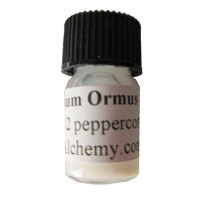 “Your Ormus alchemically is by far the best I’ve encountered as far genuine quality. So powerful that upon my initial ingestion it scared me a bit. Lol.” – O.N. “This Ormus is very powerful stuff, much stronger than other Ormus that I’ve tried before.” -Kevin D.
This is some powerful medicine. The ormus increases concentration and help with a more positive view throughout the day. It might also help to increase vitality (along with the appropriate practices) It enables for the body to do things faster. This effects fells somewhat like a stimulant, that does not make unnecessary thinking (like caffeine can do). The increased energy does not distract from a compassionate path but aids it. It surely help with yoga. It is very strong thou so it should most probably be approached with respect. Future Alchemy © 2019. All Rights Reserved.